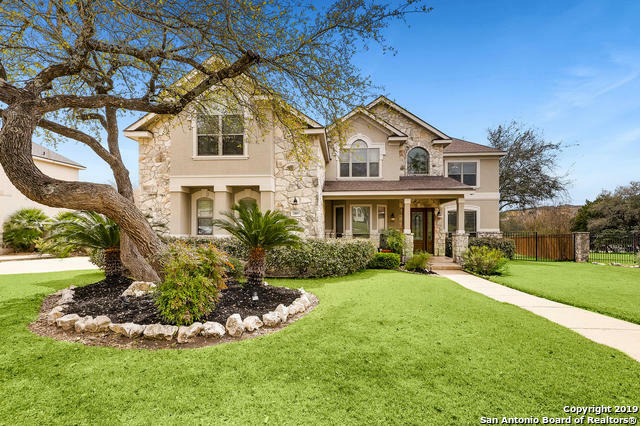 All THE TRAILS AT CANYON SPR homes currently listed for sale in San Antonio as of 04/22/2019 are shown below. You can change the search criteria at any time by pressing the 'Change Search' button below. "Gorgeous four bedroom, three full and two half bath home on a cul-de-sac lot in the guard gated neighborhood of Trails at Canyon Springs. Elegant dining room and study, light bright family room with fireplace, and an incredible kitchen with abundant storage, gas cooking, granite counters, and stainless steel appliances. Master bath has separate shower and corner tub. Large bedrooms, gameroom, and media room. Covered patio with ceiling fan plus extended patio area with greenbelt views. Roof is tw"